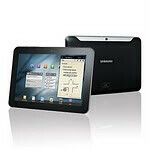 Some bad news has surfaced for those of you looking out for a Samsung Galaxy Tab 8.9. The world's thinnest tablet may not be so thin depending on where and when you grab your device. A bit part of the tablet's sleek profile is because it's screen is incredibly thin, but that thin screen may not be making it into every new Tab that comes out. It's being reported that there have been shortages in the G1F screen. Samsung had been planning to ramp up production of the Tab 8.9 tablet at the end of this month with the help of two display panel manufacturers. Unfortunately, the yield ratio for the G1F panels have been too low to meet projections. As a result, Samsung has brought in two panel manufacturers to make up the difference using GFF panels. The trouble is that the GFF panels are 30-40% thicker than the G1F panels, and because of that extra thickness, the panels are not as bright. Making things even worse is that the two different panels will be mixed in to the same shipments, meaning there is no telling which one you got until you unbox your new tablet. Michael, This article has something wrong with it. I have never heard of a manufacturer saying, "we're going to send you a tablet...but they're all different so hopefully you'll be the lucky one!" it's just not reasonable. I think you need to do a little more research before posting these ideas of yours imo. Actually Zhenghua, BigWave is correct. If an OEM will sell a product as long as there is no spec changes or reasonable or negligible customer impact then there is no need to specify who the lucky winners of this "change" will be. But thickness and brightness are specs related changes so I agree there is something fishy about the story.